After long negotiations and delays, the German federal government has now updated the rates for compensating language services. Some information I received by e-mail is given below (in German), and there is a link to the current law. I will get around to making this available soon in English for my clients and prospects. The base rate has increased by about 25% - which in fact does not keep up with the inflation rate in the period during which the old law (JVEG) applied. It is now € 1.55 per 55 characters. Texts not provided in editable electronic form in common languages are subject to a 20 euro cent surcharge per line. For more details, read below or check the link. Das Zweite Kostenrechtsmodernisierungsgesetz wurde am 23.07.2013 vom Bundespräsidenten unterzeichnet. Das Gesetz ist im heutigen Bundesgesetzblatt Nr. 42 vom 29.07.2013, S. 2586 ff. veröffentlicht worden (http://www.bgbl.de/Xaver/text.xav?start=%2F%2F*[%40attr_id%3D%27bgbl113s2586.pdf%27]&skin=pdf&bk=Bundesanzeiger_BGBl&tf=xaver.component.Text_0&hlf=xaver.component.Hitlist_0). Das Honorar für eine Übersetzung beträgt 1,55 Euro für jeweils angefangene 55 Anschläge des schriftlichen Textes (Grundhonorar). Bei nicht elektronisch zur Verfügung gestellten editierbaren Texten erhöht sich das Honorar auf 1,75 Euro für jeweils angefangene 55 Anschläge (erhöhtes Honorar). Ist die Übersetzung wegen der besonderen Umstände des Einzelfalls, insbesondere wegen der häufigen Verwendung von Fachausdrücken, der schweren Lesbarkeit des Textes, einer besonderen Eilbedürftigkeit oder weil es sich um eine in Deutschland selten vorkommende Fremdsprache handelt, besonders erschwert, beträgt das Grundhonorar 1,85 Euro und das erhöhte Honorar 2,05 Euro. Das Honorar des Dolmetschers beträgt für jede Stunde 70 Euro und, wenn er ausdrücklich für simultanes Dolmetschen herangezogen worden ist, 75 Euro. Maßgebend ist ausschließlich die bei der Heranziehung im Voraus mitgeteilte Art des Dolmetschens. Ein ausschließlich als Dolmetscher Tätiger erhält eine Ausfallentschädigung, soweit er durch die Aufhebung eines Termins, zu dem er geladen war und dessen Aufhebung nicht durch einen in seiner Person liegenden Grund veranlasst war, einen Einkommensverlust erlitten hat und ihm die Aufhebung erst am Terminstag oder an einem der beiden vorhergehenden Tage mitgeteilt worden ist. Die Ausfallentschädigung wird bis zu einem Betrag gewährt, der dem Honorar für zwei Stunden entspricht. Bitte beachten Sie, dass für die Rechnungslegung nach neu oder alt das Datum der ursprünglichen Beauftragung (für Übersetzungen) bzw. des Termins (für Dolmetschleistungen) maßgeblich ist. 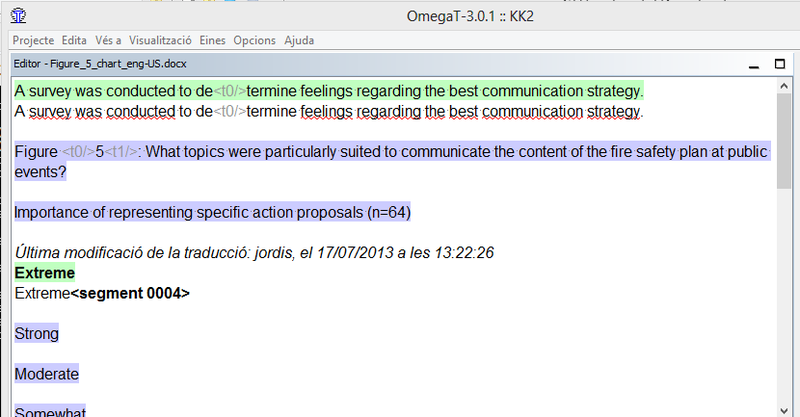 Spanish-to-English translators wanted for dissertation research! Dear readers, I received the request below tonight, which I would like to pass on to my colleagues who work as translators from Spanish to English. I don't think we have enough good research in many areas related to the tools of our trade; I hope you can find the time to assist Mr. Mellinger in his work. My name is Chris Mellinger and I am a doctoral candidate at Kent State University. I am conducting a study that will help me collect data for my dissertation, which will examine effort in translation when using computer-assisted translation software. This study is being conducted by Dr. Keiran Dunne, principal investigator, and co-investigator, Ph.D. candidate Christopher Mellinger, and it has been approved by the Kent State University Institutional Review Board. I am currently looking for Spanish-to-English translation professionals who receive some or all of their income from the language industry to participate in this study. The study consists of two parts. The first part is a survey that will be used to determine your eligibility to take part in the second half of the study. The survey questions are about your work as a professional translator, and should take approximately 5 minutes to complete. Should you qualify, the second part of the study consists of translating a text of approximately 400 words from Spanish to English using a web-based computer-assisted translation tool and without using any external resources. This translation should take no longer than 90 minutes to complete. If you are a Spanish-to-English translator who receives all or some of your income from the language industry, I would greatly appreciate 5 minutes of your time to complete this survey, and if you qualify, 90 minutes to complete the experiment. Please click on the following link (https://kent.qualtrics.com/SE/?SID=SV_2bninsg4a8DYKu9) (or cut and paste it onto your internet browser) to complete the survey. 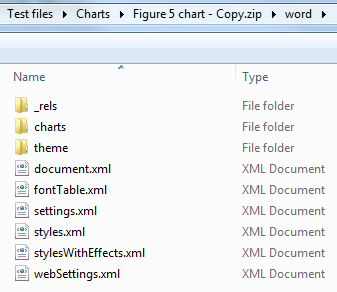 The great guessing game: file extensions in Windows! How many file types are there in the screen shot above? Use your discerning eye and write your answer in the comments of this post. Anyone who figures out the correct answer and writes it as a comment before I update this post will be offered a special "reward" for clever deduction. Update #1: A link to the solution has been posted in the comments. I will follow this up soon with a bit more explanation and a short video. In my comment with the solution, you'll also see why I hate Google's Blogger and don't recommend it to anyone, though I use it myself thanks to 5 years of habit. I'm the owner of the blog, and I can't even edit my own typos in comments, just in posts. Obviously, the Gods of Microsoft do not "thing". One would presume that they "think", however often the evidence of their actions may be against this. Update #2: Hot summer nights are better suited to screencasting than sleep, so here is the video, a little sooner and longer than planned. But the part that actually matters (1:20 - 1:55) is in fact well under a minute. 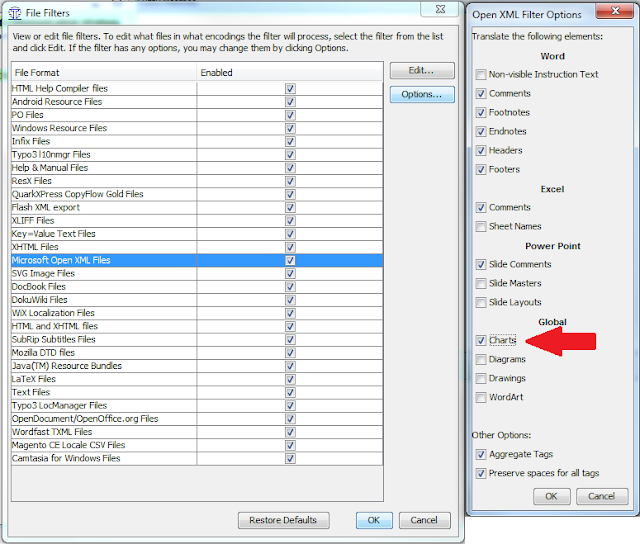 This problem of hidden file extensions has come up so often in so many ways over the years. In the translation world of CAT tools I deal with, it comes up too often in discussions of how one can change the extension of an MQXLIFF file, for example, to XLIFF or XLF so that it can be imported by SDL Trados Studio or other tools. 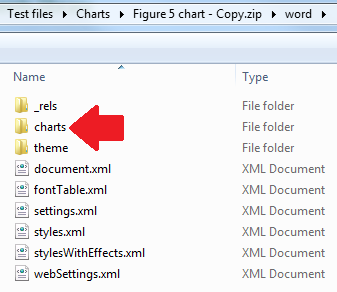 I also have to deal with this problem when I send someone an RTF and a DOC file; these two file types are indistinguishable by icon, and without visible file extensions, it is fairly hopeless to discuss these files with anyone. I had not planned to make a video on voice recognition tools any time soon, but a few remarks by my American colleague Kevin Hendzel well down in the many comments about thepigturd's letter to translators sort of goaded me into it. I thought, "What the heck, I'll just grab some text from Wikipedia, record a bit of the work with Camtasia, and post a quick demo of how easy it is to work with Dragon Naturally Speaking." So I got a text about chickens. And activated the screencast recorder. And then the trouble started. It really sucked. Working with Dragon in memoQ is usually a fairly painless process, but tonight the dogs were anxious and kept poking me in the ribs, and I never did get the microphone adjusted quite right. Some days, microphone position is everything to my scaly transcriptionist. So I suffered with a lot more editing than usual, as anyone watching the video above will see. I worked in my usual "mixed mode" manner, with both keyboard and voice control. Some colleagues who swear by DNS like to do everything by voice and would probably wipe their backsides in the WC that way as well if they could, but that's way too geeky for me. After watching my copywriting partner fly through some 10,000 words of legal translation - and edit it - in a short working day while I slogged through my 3,000 and finished long after she called it a day, I realized that I could work in the relaxed way she did with thoughtful stares at the screen, muttered bursts and the occasional keyboard touch. But today was a bad day with the Dragon. I might have gone a bit faster with the text. After all, chickens aren't rocket science or even chemistry, with its tag-ridden notation. I could have just dictated in a word processor and everything would have one faster. And if I really want a TM or want to check the terminology, alignment is fast and also a good environment for editing my first draft. I know a number of translators who work that way now. Even with a dictaphone. In his comments on the other post, Kevin Hendzel expressed a similar feeling to mine when translating with voice recognition: greater engagement and concentration on the text and its structure and meaning. But these tools are not without risk: any errors will in fact pass muster with a spelling checker, so proofreading workflows may have to be very different to be effective. I have noticed this myself - reading my text soon after I have translated it, I am very likely to overlook a missing or switched article or a homophone. Perhaps dictating into a word processor or - since I often look to the glossary hits and other hints on the right of my working window - exporting my text and re-aligning it in the CAT tool after an external rewrite may force my eyes to see things a little differently. In the two years that I have been making serious use of voice recognition I have not yet found the "perfect" workflow. There are a lot of ways I can tease better results out of this work. But even on a bad day like today, things aren't all that awful. In fact, those familiar with some of the more honest estimates of output in optimized machine translation and post-editing scenarios will realize that today's lousy results (see the end of the video), maintained over the course of a working day, meet or beat the expectations for post-editing in a highly optimized scenario. Without the brain rot typically caused by PEMT! Now that's an advantage. Why don't we stop wasting time with machine translation and instead increase output by more research into the best ways of using voice recognition technology? Ah, but voice recognition is not yet optimized for every language! Ha ha ha... like MT is or ever will be. The millions that get flushed down the toilet with machine translation could and should buy a lot of improvement with voice recognition. The real trouble with voice recognition is that you may not want your competition to use it. With or without CAT tools. 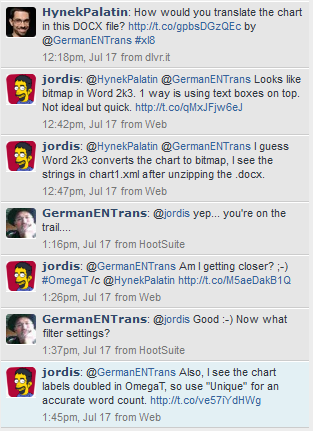 Unlike machine translation. As many may have noticed from reading this blog or following me on Twitter in recent weeks, I have begun to create and post on YouTube a larger number of videos on various topics related to translation support tools or processes to make the business of translation a little easier. Many, but not all of these videos cover the use of memoQ; there are also discussions of special file preparation, VBA macros, piece rate equivalency calculations and more. Subscribe to the channel and keep up to date as I add more material on a range of software tips and other productivity ideas for translators. 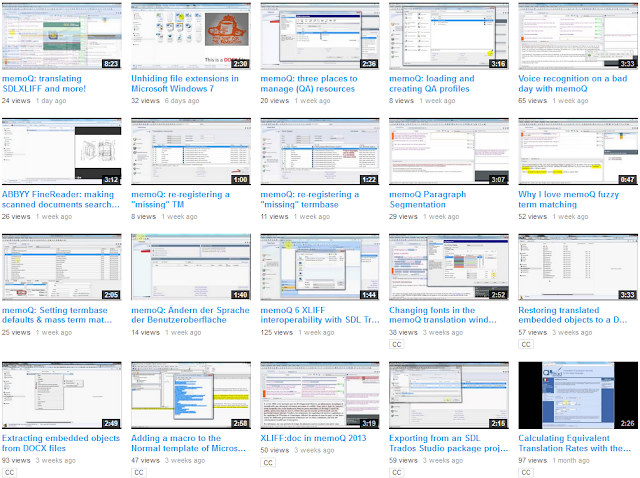 I have used a number of different tools to record and edit these videos - Camtasia in a few cases, and so far mostly the free Open Source tool CamStudio, both for Windows. The production values of the clips vary considerably as I get back into video production after a 17 year break. I'm not aiming for perfection here, but rather for quick and practical - more or less in the spirit of my memoQuickie tutorials which formed the basis of much of the e-guidebook of memoQ tips I released last year. I start gnashing my teeth before the 4-minute mark with many translation tool tutorials I see, so I try hard to keep most of the clips well under that length. I find that even the good longer videos are difficult to use as references, because I often have to search for the few minutes that interest me in an hour-long webinar recording, and without a reasonable index, that's just too difficult. Many of these videos and the ones that follow will be embedded content in courses I am developing for translator and project manager education using Moodle. These combine text, video and audio along with practice files in many cases for multimodal learning of basic and more advanced processes that those in the translation business often require. I've watched the growth of webinars in recent years as well as various other forms of distance assistance and instruction. But aside from coaching sessions for clients and colleagues using TeamViewer, I have refrained from taking part in these popular new media, because I am unconvinced of their effectiveness in many cases. This is not to say that there are not many very good webinars available, both live and recorded, but even with the best I am often left with the sense that there should be something more. Maybe something like a self-paced review course online with the resources where one can practice what was just covered in the long webinar and go over its most important points more easily. Such a resource might also be useful as a backup to live lectures or courses I or others might do. I think that having a "toolbox" of online short courses might change the way I teach in person in some positive ways. 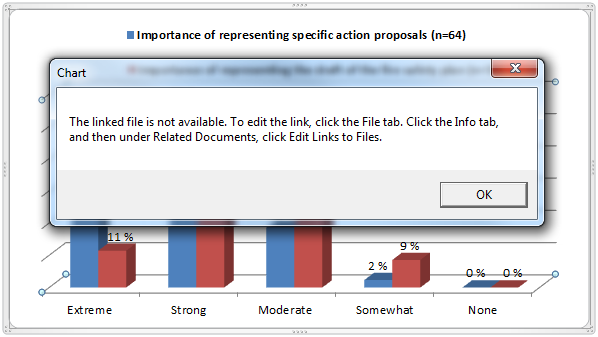 It would likely give me more flexibility in how to cover topics for groups where a range of skills are present - the "outliers" requiring more remediation or greater challenge could perhaps be served better by offering them appropriate online follow-up resources, or even drawing material from these in a live workshop as the need arises. Careful study of a wide range of current e-learning approaches in recent months has led me to think about what appears to work best and how I can learn from that and encourage others to do so as well. This has been an active and interesting discussion with quite a few friends and colleagues, and I don't expect we'll ever find the ultimate answers. But I imagine we will have fun and probably learn a lot, and maybe help others to learn some useful things too. When Kilgray introduced fuzzy term matching with the release of memoQ 2013, I was first concerned with how it worked after a few puzzling tests of the feature. Discussions with the development team soon cleared up that mystery, and I wrote an article describing the current fuzzy state of term matching technology in the translation environment tool that has done such a fine job of waking SDL and others from the long slumber of innovation that prevailed in the last decade. But questions still remained in the minds of most users as they asked why they should care about this feature and what good it would really do for them. This actually applies to more than just bad spelling. Those who translate from English will benefit from the fact that fuzzy term matching will help them if the UK source term is in the glossary but the author of the text used an American spelling. I cope with problems caused by old and new spelling conventions in German as well as the fact that a great many Germans cannot agree on how their compound words should be glued together. And my Portuguese friends tell me every week about the hassles of the spelling reform in progress in that linguistic corner. Fuzzy term matches is currently not implemented for QA checking in memoQ, but I think it would make sense for Kilgray to add this feature to allow fuzzy term matching for QA on the source side. It could be a bit of a disaster to have it on the target side, however, for reasons I will leave readers to guess. I was initially a bit skeptical of the latest version of memoQ, but as this feature and a few others have begun to "sink in", while I still don't feel comfortable with the company's hyperbole over new features like LQA, which is largely pointless for freelance translators, I do feel confident in saying that fuzzy term matching is a reason for most of us to seriously consider upgrading to memoQ 2013. This will be even more the case if it is added to the QA features. Ah, but what about the change to the comments function, Kevin? You really hated that! There's more to say on that topic now. Some of it is even good. And so it was that a group of merchants, many of them powerful men made wealthy by the work of wordsmiths, did conceive a scheme to replace workers with a translation machine, that they might increase their power and influence and add to their already swollen coffers. As their servants toiled night and day on its creation, the merchants did send soothsayers out into the world to proclaim the coming of the machine. So ruthlessly did their acolytes preach the MT gospel, glorifying its spew with much trumpeting in many a marketplace, that other merchants did allow their own greed to triumph and they too became devotees of the machine. Rejoicing in their boastings, they held out the promise of riches without labour to any who would follow them and purchase their wares. But it came to pass that these disciples learned that the machine could perform only the lowliest of the humblest translator’s tasks, for it had no mind and many tongues remained foreign to it; lo, as the machine devoured more its confusion increased! Though this discovery caused consternation amongst them and they were quietly afeared lest they lose face, vanity had made the merchants so presumptuous that they did not cease their evangelising but continued to hide behind a veil of half-truths, dissembling and exaggerating with such cunning that still many in the marketplace were duped. Fellow translators who had become despondent and were distressed lest their wisdom perish and their intelligence vanish if the will of the merchants did prevail were emboldened by this strength and support. At first there were only murmurings amongst them, for some feared incurring the wrath of the powerful money-worshippers. But slowly there arose a wave of dissension as cracks appeared in the ground beneath the philistines who would have the world believe that their machine was mightier than languages that had evolved over hundreds of years. The translators eschewed confrontation with the merchants: not because they feared the machine, for they knew full well of its weaknesses, but because they understood the lengths to which such opponents were prepared to go to protect their power. In the knowledge that they must not join in battle on a battlefield created by the merchants they saw that they must deal with them wisely and rely on their own skill and sagacity to protect their profession. Some of them did congregate in a meeting place which they named Stridonium, after the birthplace of their patron saint. There they set out a course, that they might deliver a different message. With renewed strength born of unity they conceived of the simplest of plans to quell the voices of false prophets and create a new gateway to their own honest marketplace. Theirs shall be customers of wisdom and understanding: they shall not translate for the machine, for that would be like unto casting pearls before swine. They shall not hide their light under a bushel for this they must use to illuminate their path and enlighten unknowing procurers of language. And henceforth they and their fellow translators shall diligently apply themselves to refuting false doctrine and shall not be daunted by their task. They shall reveal the failings of the machine and shall rekindle understanding of translation in the marketplace; they shall prevent extortion of the misguided until their message spreads far and wide. And they shall not allow their profession to be sacrificed on the altar of Commerce. Chartered Linguist Christina Guy is a Dutch to English legal translator and interpreter based in The Netherlands with whom I collaborate for international English copywriting. As a native of the UK with long experience in providing language services in the legal, commercial and diplomatic sectors, she is a passionate and articulate advocate of efficient quality. Several years ago, she and other committed language specialists established the translators' forum Stridonium to facilitate professional exchange in a private atmosphere of competence and mutual support. Christina's previous contribution to Translation Tribulations, A sermon from Ede, was inspired by her first exposure to the mad machinations of the MT muftis of TAUS and their allies. The response of grass-eating sheep to the outrageous proposal of scatalogically stupid unilateral rate reductions by our porcine pals at thebigword has revealed that said ovine entities do in fact have a healthy bit of the wolf under those fleeces that the LSP had hoped to shear with their acquiescence. Subject: [ProZ.com Forums] Please, refrain from advertising. The post is hidden from public view, but is editable and visible to you. You are kindly requested to edit it in line with this rule, so it can be made visible. The blog linked to contains adverts. Unauthorized commercial solicitation, sent via the forums is not allowed. Paid advertising is available from ProZ.com in designated areas of the site. But the battle raged on in Twitspace and Facebook (a proud member of the NSA Partner Program), e-mail routes were ambushed and telephone contacts cut and cauterized. Throughout the day, Poop Managers (PMs) tried to deal with what had hit the fan and assure individual translators that their prior rates would be restored, but many were not fooled. Dirt was dug on executive compensation and expenses and thrown up in barricades whose crests were prickly as porcupine backs with bayonets fixed for the next approach of the wavering LSP. One afternoon, the CEO of The Pig Turd was riding in his limousine when he saw two men along the road-side eating grass. "We're translators, and we don't have any money for food," the man replied. "We have to eat grass." "Well, then, you can come with me to my house and I'll feed you," the CEO of The Pig Turd said. "Bring them along," the CEO of The Pig Turd replied. Turning to the other poor man he stated, "You may come with us also." The second man, in a pitiful voice, then said, "But sir, I also have a wife and six children with me!" "Bring them all as well," the CEO of The Pig Turd answered. Once under way, one of the translators turned to the CEO of The Pig Turd and said, "Sir, you are too kind. Thank you for taking all of us with you." The CEO of The Pig Turd replied, "Glad to do it. You'll really love my place. The grass is almost a foot high!" We are writing to advise you that The Pig Turd is to amend the fees it pays to translators. This will bring The Pig Turd into line with other large linguistic whorehouses that are servicing the needs of large Government and Corporate contracts. This has been driven by changes in the way that these organisations operate which has created a downward pressure on costs. Coupled with an increased cost of sales and significantly extended sales cycle, this has eroded margins to the point where the rates that we are currently paying you are not viable in this very competitive market place. I would like to explain the efforts we put into generating business which creates work for you as one little cog in a wheel of 4,000 translators in more than 70 countries who slave at the wordface for us every month. At present, The Pig Turd employs 60 sales people worldwide who, as a group have to take 80 flights a month, and on average these martyrs to the Cause must spend 2-3 nights a week away from their families and homes, seeking whatever comfort and entertainment can be found with their fat expense accounts on lonely nights. We employ a further 50 people who recruit, interview and impose unpaid tests on wannabe linguists in order to maintain the known standard of our service. In addition, we monitor our global wordforce with more than 250 overseers from our 10 global offices who interfere between end customers and yourselves. We also have over 50 people working on our technology so that we can improve our internal efficiency or at least screw down costs and provide our executives with the state-of-the-art company vehicles and other perks they deserve, and that you need to represent your service to the world. However, having said all of this, never before has our industry experienced such huge downward bowel pressure from both the private and public sector to reduce prices. This, of course, is not necessarily for their own profit but simply a reaction to the state of world economies. At The Pig Turd we have endeavoured to keep our rates to the highest possible level whilst keeping your compensation in line, but your rates continue to impact the profitability of the company and the job satisfaction of those who live off your efforts. Therefore, with effect from Thursday 18th July, The Pig Turd will reduce the rates paid by 15% in the hopes that profits can remain at record levels and our representatives can travel in style as they seek new words for you to mine. These rate changes are not retrospective but will apply to any new work received from Thursday 18th July 2013, though reductions in current projects as voluntary contributions to executive relief at The Pig Turd will be given due consideration in the priority assignment of future projects. 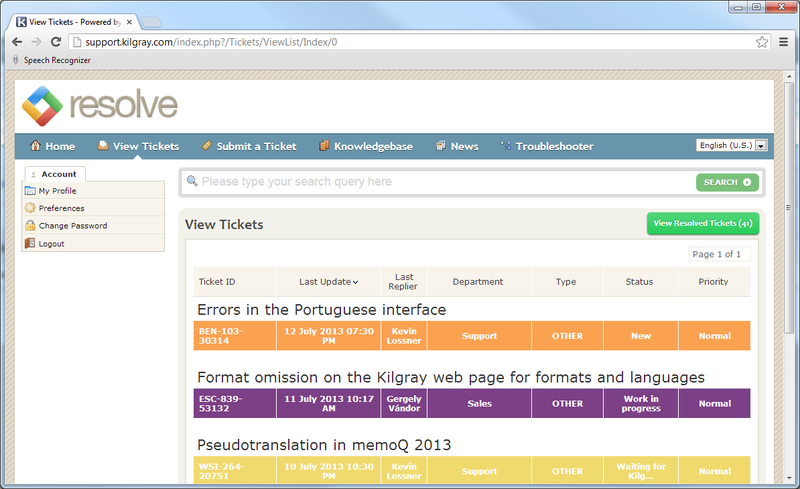 It's been some time now since Kilgray introduced a ticket system for its support issues. 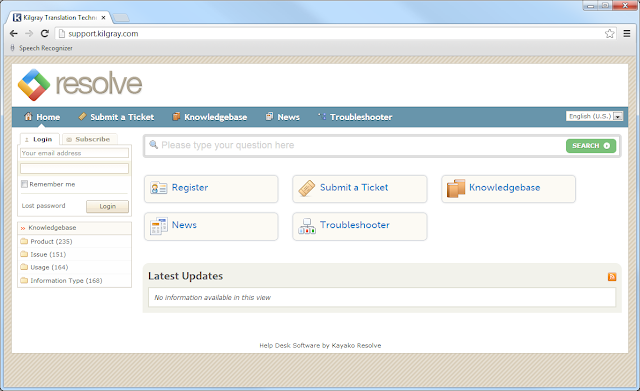 It seems to work well on the whole, and I do like being able to look at the ticket history when I am logged in to the system to read a response to a question or a bug report I've sent. The main problem for me with Kilgray's support ticket system Resolve isn't Kilgray's problem. It's mine. Sometimes the responses sent by e-mail don't arrive in my inbox. I am sure this is something with my system, because e-mail correspondence with some clients and colleagues disappears down the same dark hole sometimes, even though messages before and after in a sequence will arrive. Don't tell me to look in my Spam folder, etc. - I know that drill well enough after decades of e-mail. So sometimes I start to wonder about the status of a Kilgray support ticket. Or I get an automated e-mail from the system saying that because I have not responded to a request for more information for a zillion hours, the ticket will be closed. Or I want to look up an old ticket for information it contains, and I have deleted all the e-mails with links. Then I go directly to the Support system and log in. Some tickets can be submitted there without logging in to the system. Once you have logged in, all of your current and past support tickets will be visible, and you can read the information, re-open a ticket or rate the support you received. 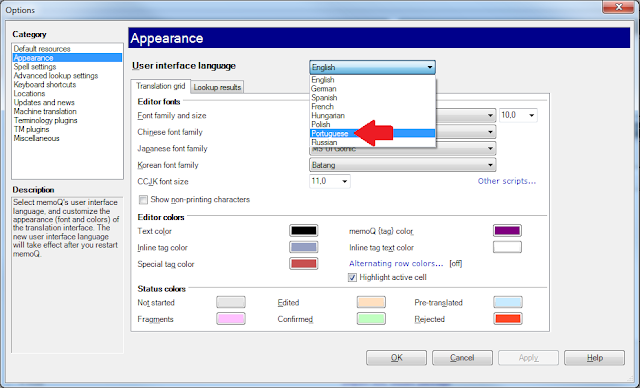 There are few things that irritate me more when watching a software demonstration than seeing dialogs and buttons appear in a language which differs from the demonstration language. And if I am preparing instructions for someone in another language, I want to be sure that if it is German, the option to cancel by clicking the correspondending button in a dialog will be Abbruch and not Cancel or Cancelar. Therefore, the Windows operating system I use is Windows 7 Ultimate. With this operating system, I can activate any of the languages supported by Microsoft after downloading (for free) and installing them. Each user login I create can be configured to use a separate operating system (and it has its own Desktop, so I can avoid showing off my usual clutter of icons in my working profile). 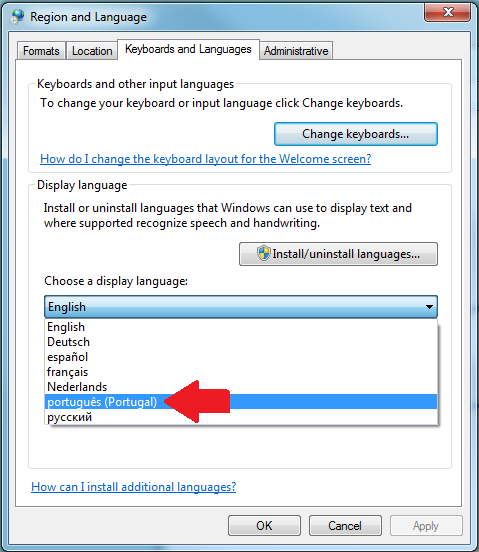 Simply by switching the login, I can toggle between German, English, Russian and Portuguese systems quickly. Changing the operating system in a profile requires you to log out and log back in to that profile to see the new operating system you have selected. 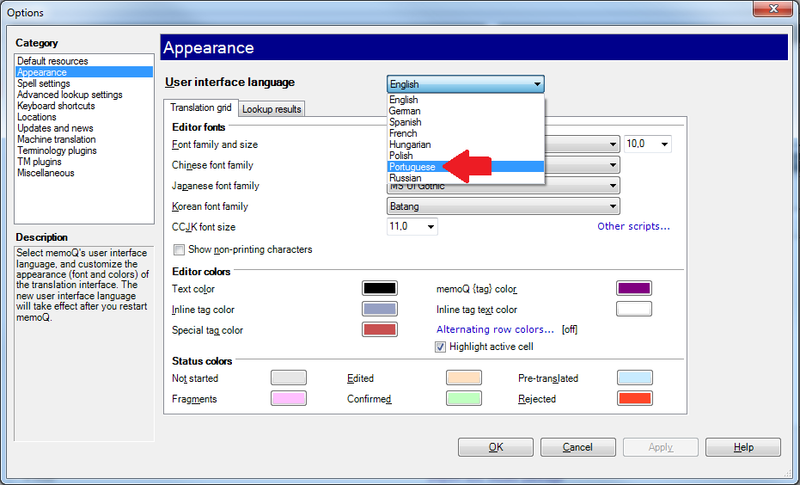 To see the new language chosen for memoQ, you must quit the application and restart it, unlike other settings changes possible for the appearance, which become active as soon as OK or Apply is clicked. Including an error log with a message to Kilgray Support (support@kilgray.com) may be helpful to resolve an error more quickly. Look for the error log file that coincides with the time the error(s) occurred. memoQ error logs can accumulate and take up a great deal of space on one's hard drive! This is especially the case after new versions have been released without adequate testing. How much space am I talking about? After the release of memoQ 5 about two years ago, I purged the accumulation of error logs and recovered some 10 GB of space. 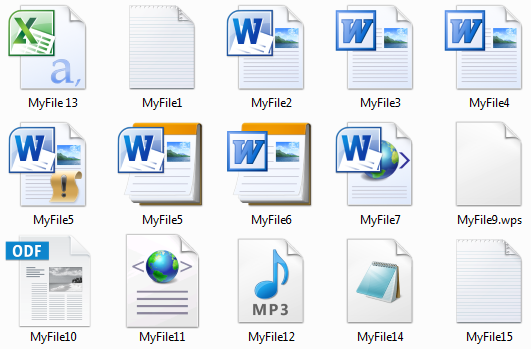 The individual files are small, but there were a lot. After the release of version 6, I did another purge, which freed up several gigabytes, and my purge today - which covered the time since the release of version 6.2 at the end of November 2012 - recovered about 600 MB, with very few errors logged for version 6.2 after February. The number of error logs increased again after version 6.5 (memoQ 2013) was released, but they were not too frightening in number, because I still work in the stable version 6.2 most of the time. Where can these error logs be found? The locations depend on your operating system version. For information on where to find the relevant memoQ error logs, consult the up-to-date information in the Kilgray knowledgebase here.